The term “aiki” does not readily appear in the Japanese language outside the scope of Budo. This has led to many possible interpretations of the word. 合 is mainly used in compounds to mean ‘combine, unite, join together, meet’, examples being 合同 (combined/united), 合成 (composition), 結合 (unite/combine/join together), 連合 (union/alliance/association), 統合 (combine/unify), and 合意 (mutual agreement). There is an idea of reciprocity, 知り合う (to get to know one another), 話し合い (talk/discussion/negotiation), and 待ち合わせる (meet by appointment). 気 is often used to describe a feeling, as in なになに気がする (‘I feel X’, as in terms of thinking but with less cognitive reasoning), and 気持ち (feeling/sensation); it is used to mean energy or force, as in 電気 (electricity) and 磁気 (magnetism); it can also refer to qualities or aspects of people or things, as in 気質 (spirit/trait/temperament). The term dō is also found in martial arts such as judo and kendo, and in various non-martial arts, such as Japanese calligraphy (shodō), flower arranging (kadō) and tea ceremony (chadō or sadō). Therefore, from a purely literal interpretation, aikido is the “Way of combining forces”, in that the term aiki refers to the martial arts principle or tactic of blending with an attacker’s movements for the purpose of controlling their actions with minimal effort. One applies aiki by understanding the rhythm and intent of the attacker to find the optimal position and timing to apply a counter-technique. By the second century A.D., there was widespread use of sharp-edged tools in Japan. Tools such as hatchets, knives, and arrowheads were made of copper. These weapons were used for protection and to compete and exert one’s power over other people or other groups. With the development of weapons came the study and development of fighting techniques. The strongest of these groups was the Yamato family (the ancestors of Japan’s Royal Family). The history of the Yamato was told and handed down by professional kataribe—storytellers who would memorize and recite tales of their history before the written word was used. Kataribe selected children with superior memories to carry on the stories of the Yamato. When the written word was introduced in Japan from China, these words were changed to become Japanese. Using these words, the stories told by the kataribe were written down to form Japan’s oldest book, the Kojiki. In this book are stories of how the country of Japan was formed, how the ancient Yamato planned the conquest of Izumo no Kuni, and how battles were fought using weapons. The story of these battles begins with Amaterasu, who sends her own child, Takemikazuchi no Kami, to conquer Izumo no Kuni. He was met with resistance by the ruling family of Izumo no Kuni, and his powers were challenged by Takeminakata no Kami, the eldest son of the ruler of Izumo no Kuni. When Takeminakata grabbed the arm of Takemikazuchi no Kami, the arm was thick and strong like an ice pillar and could not be fully grasped, like the edge of a sword. However, when Takemikazuchi grabbed Takeminakata’s arm, he could easily swing him around and throw him as if he were swinging a piece of straw. In this way, it is said that Takemikazuchi no Kami was able to take over Izumo no Kuni without a deadly battle. This type of story is interesting because of its similarities with Aikido. Through these stories, we can see that martial arts-like principles existed even in ancient times. Since then, groups and individuals studied and practiced martial arts, which led to its further development. In the eighth century, martial arts study was promoted with the establishment of the Butokuden, a government-sanctioned dojo, in the city of Kyoto. The actual basis of martial arts was established during the Samurai rule of Japan during the Kamakura Era (twelfth century). 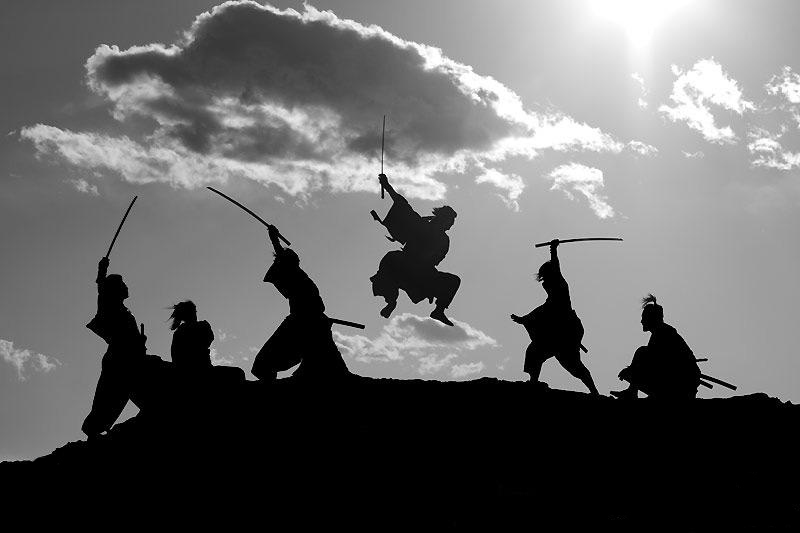 From this time until the breakdown of Samurai rule in the nineteenth century, all Samurai were required to create, study, and develop martial arts. In the beginning, however, fighting techniques were designed mainly for exceptionally strong individuals. 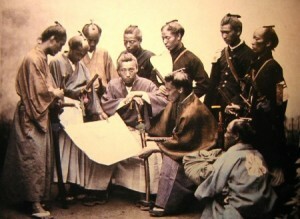 During the Muromachi Era (fourteenth century), fighting techniques became systematized and organized and were taught and passed down. Complex techniques that had never been seen before were developed. The techniques that were founded during this period became the basis of the various martial arts that were created or changed over the next several hundred years. Many of today’s martial arts can be traced back to this period. With the arrival of the gun in Japan in the sixteenth century, there was also a major change in martial arts. Techniques that were originally designed for men in armor were changed and improved for use with lighter clothing. Techniques of this sort became the mainstream for martial arts during this period. The Age of Provincial Wars came to an end in the seventeenth century with the coming of the Edo Era. With the absence of battles and less need for fighting techniques, the purpose of martial techniques changed from solely a tool for fighting to a method for training and disciplining one’s body and mind. The development of Bushido, the code for the Samurai’s life, was deepened under the influence of Shintoism, Buddhism, and Confucianism, and with the development of Japanese literature. The purpose of the martial arts evolved from simply killing the enemy to the development of a higher level of technique and philosophy. 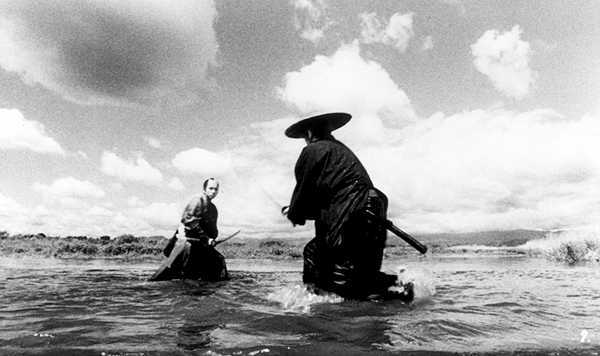 In the nineteenth century, the Samurai society came to an end. Budo and Bujutsu were not as essential in the new society. Newly introduced Western ideas and technologies were more favored than old traditions, and Budo dojos and Budo styles dwindled rapidly as lifestyles changed. Upon entering the twentieth century, Budo was looked upon with renewed interest as a part of the education of Japanese youth. Budo, centered around Judo and Kendo, became so widespread that it seemed that all Japanese were once again studying some sort of Budo. However, after World War II, the Allied nations who occupied Japan outlawed the practice of Budo in the belief that the martial arts lead to militarism. With the rebuilding of Japan and the slow return of stability in the lives of Japanese, this misunderstanding of Budo slowly faded, and around the 1950s Budo began to regain its popularity once more. 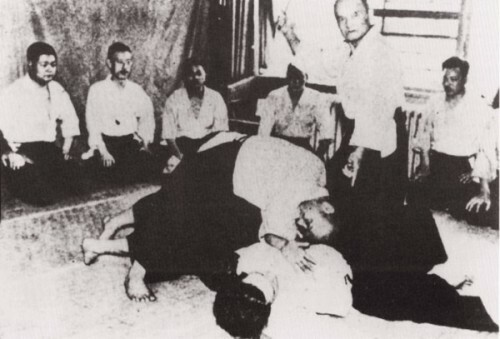 However, with the widespread popularity of Budo, keeping a high standard of teaching sometimes became difficult, and Aikido had its share of instructors and high-ranking persons who did not have a full understanding of correct techniques and philosophy. Consequently, rank was easily given to many students who were not worthy of those ranks. The number of groups or instructors who studied correct Budo and correct Aikido were few. In Florida, we give the utmost effort to study and spread what we believe to be the most correct and pure Aikido, with an understanding of the history of Bujutsu and Budo. It is Saotome sensei’s wish that his teachings can reach each and every member and that they go forward in this wonderful Aikido. The art of Aikido evolved from a variety of classical Japanese combative arts. Many forms and movements in Aikido stem from sword, knife, stick, spear, or archery movements. However, the majority of Aikido comes from an extremely effective open-hand fighting art called Daito-ryu Aiki-jujutsu. The development of Aikido from a purely combative art to a study of the way of harmony can be followed from the founding of the roots of Aikido in the ninth century to the teachings today. The very early history is not completely clear, but the roots of this art are found in the ninth century in a fighting style developed by Prince Sadazumi, the sixth son of Emperor Seiwa. This art, still in simple form, was passed down in their family, the Minamoto, to Shinra Saburo Minamoto no Yoshimitsu, who developed and organized the fundamental principles of Daito-ryu. Yoshimitsu allegedly gained insight by watching spiders subdue their prey. To develop more effective techniques, he also studied the anatomy of joints and tissues by dissecting cadavers. Yoshimitsu’s second son, Yoshikiyo, moved to the Kai region of Japan and established the Takeda family and clan. The family’s very sophisticated fighting art was passed down through the Takeda group in secrecy. Eventually this art took on the name of Daito-ryu (or Daito-style). The title “Daito” is said to come from the name of Yoshimitsu’s Daito mansion. It is also attributed to a twenty-fifth generation Takeda retainer, Daito Kyunosuke. Throughout the history of the clan, only a select few were allowed to study Daito-ryu. In 1574, after the Takeda clan was defeated in a war, Takeda Kunitsugu fled to the Aizu region, bringing the art of Daito-ryu with him. The art was still only practiced by a chosen few and was one of the secret Aizu Otome-waza, a group of secret martial arts in Aizu. Eventually called Daito-ryu Aiki-jujutsu, it was to remain completely unknown to the general public until three centuries later. In the late nineteenth century, as Japan was evolving from a feudal Samurai culture to a more Westernized modern society, a descendent of the Takeda family, Takeda Sokaku, brought Daito-ryu to the public for the first time in nearly a thousand years. 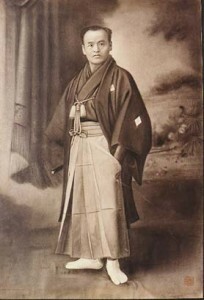 Takeda Sokaku traveled through Japan demonstrating Daito-ryu and refining his techniques through actual combat by challenging other martial artists—or anyone willing to fight. He finally settled in Hokkaido to teach his secret techniques. Takeda Sokaku’s descendants still follow his example and continue to teach Daito-ryu Aiki-jujutsu today at their Daitokan Dojo in Abashiri, Hokkaido.